Virginia is known as “the birthplace of a nation” since Jamestown, Virginia was the first English settlement in the United States as well as the first capital of Virginia. Virginia was named for England’s “Virgin Queen”, Elizabeth I and the state’s nickname is “Old Dominion”. 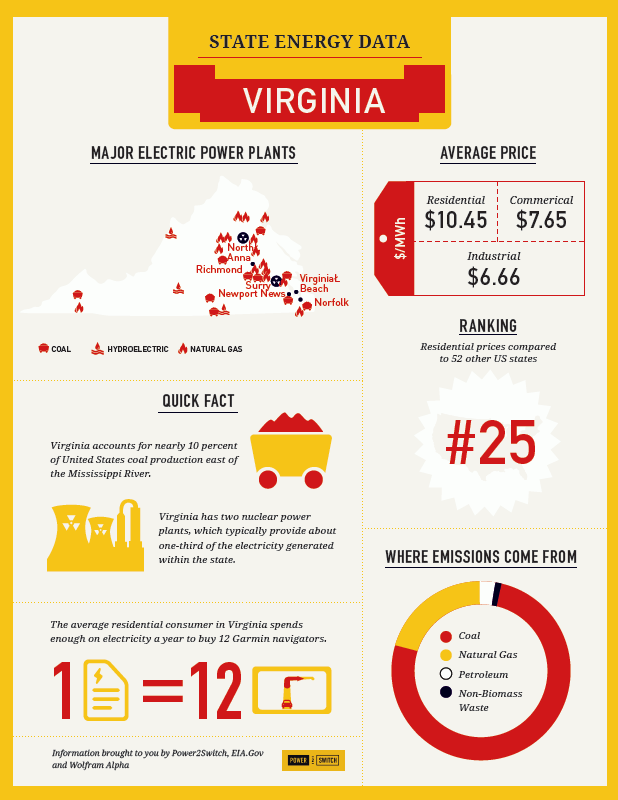 Virginia is the next stop in our United States of Energy data series, ranking number 25 in residential electricity prices compared to 52 other US states averaging $10.45 Megawatts per hour. Major electric power plants include coal, hydroelectric and natural gas. Virginia accounts for nearly 10 percent of United States coal production east of the Mississippi River. 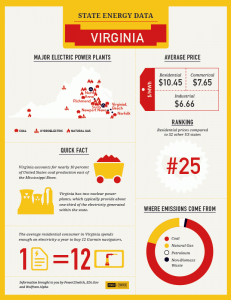 Virginia has two nuclear power plants, which typically provide about one-third of the electricity generated within the state. Did you know? Another state nickname for Virginia is “Mother of Presidents” because eight U.S. presidents were born in Virginia. The eight United States Presidents that were born in Virginia are George Washington, Thomas Jefferson, James Madison, James Monroe, William Harrison, John Tyler, Zachary Taylor, and Woodrow Wilson. Virginia contains two presidential estates: George Washington’s Mount Vernon and Thomas Jefferson’s Monticello. Not only was Virginia the birthplace of eight U.S. presidents, but more people in Virginia work for the United States government than any other industry. Tune in tomorrow for some more fun facts! Who takes care of the wires?